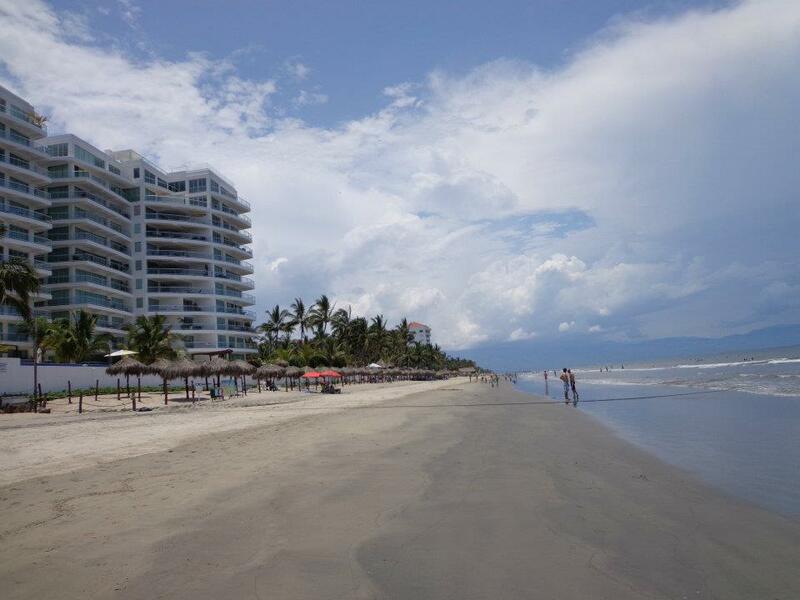 Flamingos Beach runs parallel to the modern and exclusive residential-and-resort community of Nuevo Vallarta / Flamingos. This area and its beach is a popular vacation destination for individuals and families seeking a peaceful, tranquil, and relaxed atmosphere. Fronting a series of sprawling all-inclusive resorts and impressive beach-front condo complexes, the pristine Flamingos Beach stretches 8-miles in length, and is the longest and widest walkable beach on the coast of Banderas Bay. Year round, gorgeous Flamingos Beach enjoys sparkling sunshine and water conditions that are perfect for swimming, boogie boarding, wind surfing, banana-boat rides, Jet Skis, Hobbie Cats, kayaking and parasailing. An activity shack on the beach between the Samba Resort and the Acqua condo complex rents out water-sports equipment to visitors who come to enjoy a day of fun and sun along beautiful Flamingos Beach. Right on the sands of Flamingos Beach directly in front of the Del Canto condo complex there is a special fenced-off area reserved for turtle egg hatching, and a small turtle education hut. Once the protected eggs begin to hatch, a turtle-release schedule is posted on the fence, or a small sign is placed in the sand. While overseen by government volunteers, visitors are welcome to briefly assist in releasing the baby turtles on the beach and can cheer them on as they slowly make their way into the ocean. The turtle releases occur near dusk which is a time when fewer predators are circling in the air ready to pluck up the babies for a tasty meal. To participate in the turtle release program, a small donation is required.